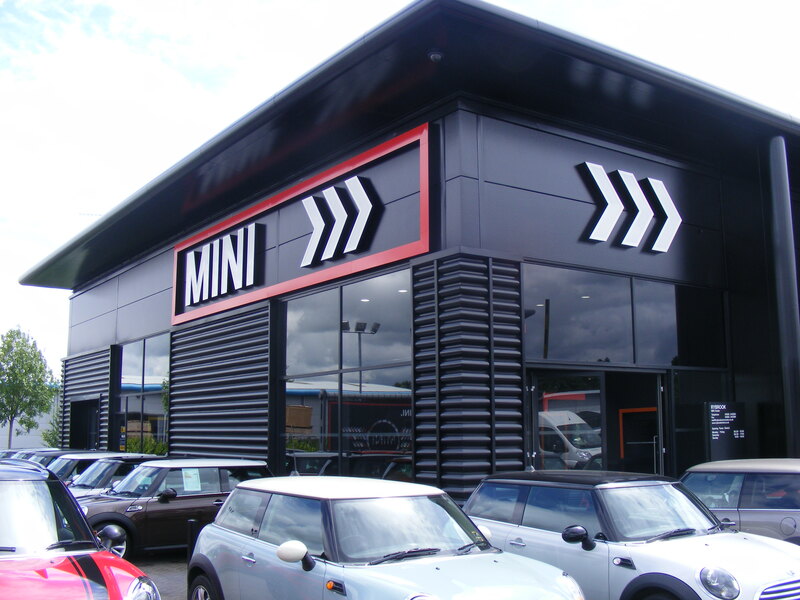 A car showroom re-coating project can dramatically enhance the appearance of a dealership. A car is one of the single most expensive items a person will purchase and the choice they make is influenced by a variety of factors. The environment cars are placed in for sale makes an impression on customers and we can help make this impact a positive one. Recoating architectural metalwork in car dealerships is a highly professional service we offer at Vanda Coatings. We will spray cladding, curtain walling, window and door frames, entrance canopies, staircases and office furniture in perfect finishes. All work will be carried out with little disruption to business as our teams work outside of showroom opening hours. Why Choose Vanda Coatings for Car Showroom Spraying? How a car showroom looks has a major impact on the number of sales made, so it is vital you choose an established onsite spraying company experienced in restoring all types of metal surfaces. We are that company. Major dealerships trust us to complete car showroom refurbishment projects for them all over the UK. We have worked with a wide range of automotive brands including Aston Martin, Audi, BMW, Honda, Mini, Nissan, Peugeot, Porsche, Subaru, Tesla, Vauxhall and VW. We are happy to work on individual dealerships anywhere in the UK or complete nationwide rollout programmes. Business should come first, so it is important a dealership can continue trading. Consequently, our teams often work through the night to complete projects outside of opening hours. If the whole car showroom is being refurbished there may be other trades on site and our operatives are used to working alongside others effectively. Dealership premises are often high and all our Vanda operatives are experienced in working at height with IPAF and PASMA certification because health and safety is vital. We are insured up to £10 million. What Methods are used to Recoat Metalwork in Car Dealerships? Before any actual re-spraying takes place we know that preparation is the most important part of any project. We spend time on this part of the process, so that the final finish is as sleek as possible. Every substrate is different and our teams tackle each job according to requirements, but the following points serve as a guide on what is involved in recoating car dealerships. We will make sure all surfaces are clean and clear of any grease otherwise layers that are sprayed on will not stay stuck to the substrate. A pressure washer may need to be used or if cladding is in particularly bad condition soda blasting may be called for. The Vanda team leader will examine all metalwork on the building and highlight any scratches, dents and cut edge corrosion which will all be fixed. An even surface is crucial before the next stages are accomplished. The powder coating that was applied to metal in a factory during manufacturing can fail in some way and may have chipped or bubbled up. Surfaces are sometimes hand or roller painted which results in small, unsightly ridges. Any uneven surfaces will be feathered out and sanded down and this abrasion is also necessary to key the surface ready for the next coat to stick to it adequately. There is always dust following abrasion through sanding and this can be blown away using an airline which can be attached to the machine used for spray painting. The substrate may also be washed down or wiped using tack cloth. Because cars are so valuable, they obviously need to be protected from overspray. Sometimes vehicles can be moved out of the way or covered with plastic. In other circumstances, it may be easier to build a tent around the area that is being recoated. Any overspray will then be contained within the tented area. Adjacent surfaces ranging from whole staircases to light fittings and including nearby cars will still be masked off using a combination of polythene, brown paper and masking tape. If a primer needs to be used in order to seal the metal and or to key the substrate then this will be sprayed on and left to dry thoroughly before any top coats are spray applied. We use a range of finishes according to the type of substrate they are sprayed onto and these top coats are available in any RAL or BS colour. All our sprayers are experienced in various techniques of applying coatings, so the end result will be perfect. Our Vanda teams will de-mask and remove any rubbish from the site leaving it in a pristine condition.